Tilted Horizons: Youth Motorcycles Banned? Once again, American motorcyclists are threatened by the (one hopes) unintended consequences of a law. A few months ago, Congress passed the Consumer Product Safety Improvement Act of 2008 (CPSIA). According to section 101(a) of the CPSIA, all youth products containing lead must have less than 600 parts per million (ppm) by weight. OK, how can we have a problem with making childrens' everyday toys safer? As happens many times, a law as enacted seems fine, but the trouble begins when the governmental entity responsible for putting the law into play writes the rules and regulations...kinda like the health care loophole we've been dealing with for years. In this case, the Consumer Product Safety Commission (CPSC) has interpreted the CPSIA to apply to various components of youth motorcycles and ATVs, including the engine, brakes, suspension, battery and other mechanical parts. While it seems the lead levels in these parts are above the minimum threshold, I've never heard of kids injesting parts off their motorcycles, and I bet you haven't either. 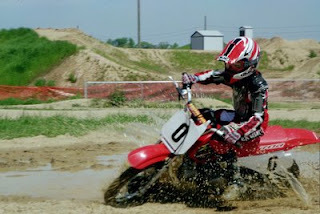 The only motorcyle-related objects my son (pic below) ever injested were a lot of hot dogs at the local MX track. The CPSC's threated implementation of the act threatens to end youth off-highway vehicle riding entirely. My local "big 4" dealer has already halted sales of youth OHVs and associated parts and accessories. You can help by contacting your Federal representatives and senators; the AMA makes it super-easy -- go here and fill in your name and state and in about 30 seconds emails to your Fed officials will be on the way. A few more laps, then I'm stopping for a nice peanut butter 'n' brake shoe sandwhich! Maybe "unintended consequences" but I suspect further evidence that the Congress is getting stupider and stupider. Not that we really need much more evidence. The average 12-year-old rider could eloquently inform those Congressional nitwits and their regulatory minions that kids don't eat or snort those lead-containing batteries, so there is no likely means for ingesting the lead. Thanks for visiting and commenting, Anon. In this instance, the Consumer Product Safety Commission also failed Common Sense 101 by their interpretation of the Consumer Product Safety Improvement Act of 2008.